For preventing and treating arthritis, psoriasis and physical injuries. Beneficial for joint and skin health. Marine Collagen contains Naticol, a pure and concentrated proprietary hydrolysed marine collagen. Collagen represents nearly 80% of the weight of connective tissue. It plays a crucial role in ensuring cohesion, elasticity, mechanical resistance and tissue regeneration. As we grow older, collagen production tends to decrease with visible consequences for the skin and sensitivity in the joints. From the age of 25, collagen production decreases by approximately 1.5% a year; by around 45, collagen levels may have fallen by up to 30%. Collagen is not provided by the diet and supplementation can therefore play a particularly important role. ¤ Marine Collagen contains a natural source of type 1 collagen, the most important protein in connective tissue and skin. It comprises low molecular weight molecules which make it very easily assimilated. It is rich in glycine, proline and hydroxyproline, the principal molecules in the skin. ¤ Regular supplementation with marine collagen can help slow down the signs of skin ageing by increasing collagen production, thus improving the skin's elasticity and firmness and reducing fine lines and wrinkles. Clinical studies show that hydrolysed collagen targets and benefits connective tissue (the main component of joints). Taken with complementary supplements (such as glucosamine or chondroitin), daily supplementation with hydrolysed collagen appears to relieve pain and improve joint mobility. It is also thought that hydrolysed collagen stimulates production of chondrocytes, the cells involved in biosynthesis of type II collagen, which is essential for building new cartilage. 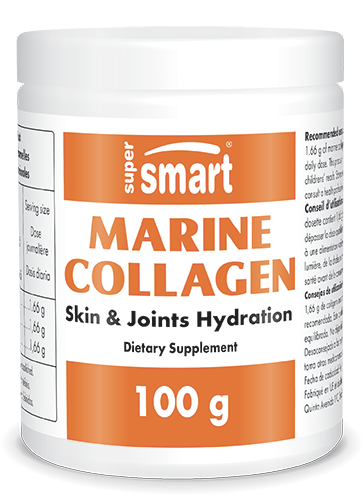 ¤ Marine Collagen is a natural supplement that benefits the health and appearance of the skin as well as the health of the joints. Adults. Take one dosette a day diluted in a glass of water. Each dosette contains 1.66 g of marine collagen. Warning: contains fish derivatives.